The roots of this band lie in two Harrow County Grammar School bands, The Madisons (who included Glover, Lander and Shields in their personnel) and The Lightnings (who featured the Carter-Dimmocks and Andy Ross). As the members of both bands began to leave school and drift away from the bands the remaining members decided that their best chance was to merge, which they did in October 1963 as The Lightnings initially, although by July 1964 they had changed to the rather more hip name of Episode Six. They got plenty of live work including a four week assignment at a Frankfurt club. Their music was essentially melodic ballads with lavish harmonies, but after the Frankfurt trip they underwent their first line-up change when Andy Ross quit the music business to get married. His replacement was one Ian Gillan, who, of course would go on to find fame and fortune with Deep Purple and later form his own band. Their first 45, Put Yourself In My Place, was a Beatles-influenced song, although a catchy Roger Glover song was used on the flip. The follow-up, I Hear Trumpets Blow, was a cover of an old Tokens song and again a self-penned number, this time by drummer Harvey Shields, was used on the flip. Their third 45 was a very good cover of The Beatles' Here, There And Everywhere with another Roger Glover song on the flip. There is a very rare French EP which contains their second and third singles. This changes hands for a lot of money. Still the sad fact was that after three singles the band had made little impact and their manager, Gloria Bristow, decided to try something different - a pretty awful cover of Charles Aznavour's I Will Break Your Heart which was credited to Sheila Carter and Episode Six and did nothing to assist the band's cause. 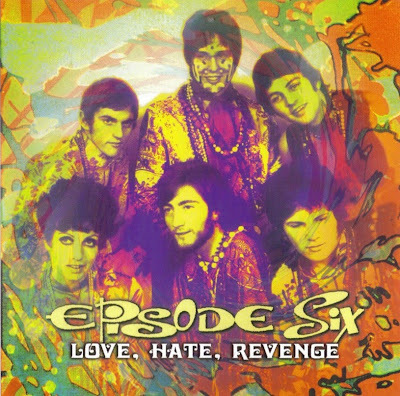 The band spent the Christmas of 1966 working in Beirut and some Eastern influence is evident on Love, Hate, Revenge, which was their next 45 release and one of their better offerings. After their next effort, a cover of Tim Rose's Morning Dew, Harvey Shields left the band to form a duo with a belly dancer he'd met during their spell in Beirut. He was replaced by John Kerrison. The first recording by the new line-up was actually a single, I Won't Hurt You, credited to Neo Maya (which was a pseudonym used by Graham Carter-Dimmock). Since no one had heard of Neo Maya very few people bought it and it's their hardest UK release to track down. Their next 'group' release, I Can See Through You, was the first self-penned song they'd been allowed to use as an 'A' side. Written by Roger Glover, there was a hint of psychedelia in its powerful backing, which was ideally suited to late 1967 when the single came out. It also featured a powerful vocal performance by Ian Gillan. Surprisingly it wasn't a hit and the group's dissatisfaction with Pye's distribution of it led them to sign a new record deal with MGM. Their first single for their new label, Little One, featured lots of brass and was very different to its predecessor, one thing both had in common though was poor sales. However, the band continued to believe they were on the verge of a breakthrough for Ian Gillan turned down the chance to join his old mate Nick Simper (who he'd worked with previously) in an embryonic Deep Purple line-up. One member who did part company with the band was John Kerrison after a dressing room row - at his final appearance with them at The Boathouse Kew, he set up his drum-kit at the opposite end of the hall from the rest of the band. He was replaced by ex-Herd member Mick Underwood. The band changed labels again to new Decca subsidiary Chapter One, but their first effort was of more interest for the Ian Gillian-written 'B' side Mr. Universe than the uninspired 'A' side. Of more interest was the band's final 45, an uptempo over-the-top guitar instrumental, Mozart vs. The Rest, probably inspired by Love Sculpture's Sabre Dance. In April 1969 the band entered the studio to begin recording tracks for a long-delayed album which had a working title of The Story So Far but it wasn't to be. Ian Gillan was lured away to replace Deep Purple's departing vocalist Rod Evans and Roger Glover joined him in Deep Purple a few days later. This ripped the heart out of the band which carried on briefly and then collapsed. Of the remaining members the Carter-Dimmocks went out to Beirut briefly to work as Episode Six but she returned to the UK later marrying Harmony Grass' Tom Marshall and Graham became a booking agent arranging for bands to tour Middle East hotels. Mick Underwood became a founder member of Quatermass and, after briefly playing for a band called The Confederates, Tony Lander set up an interior decorating business.